Alright, time for what you've all been waiting to read about: the food! ERMG the food! 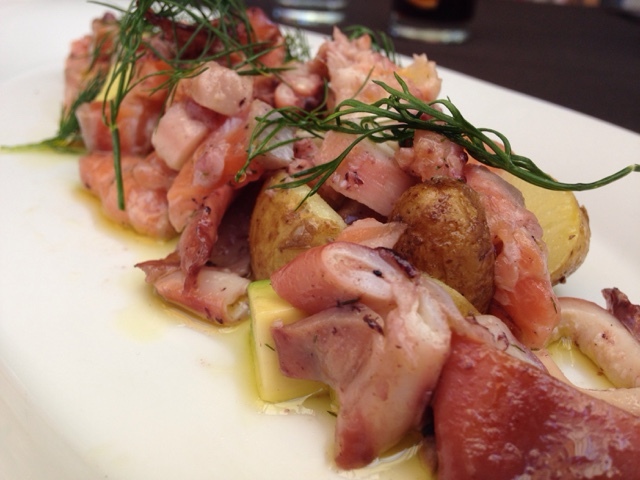 Warning: if you don't love seafood, this is not the post for you. 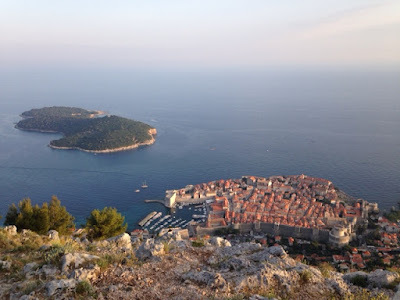 But if you do, read on friends and prepare to die of jealousy/experience an insatiable urge to buy a flight the Dalmatian Coast now now. I think we'll do this photo-slideshow style, with a brief introductory note. 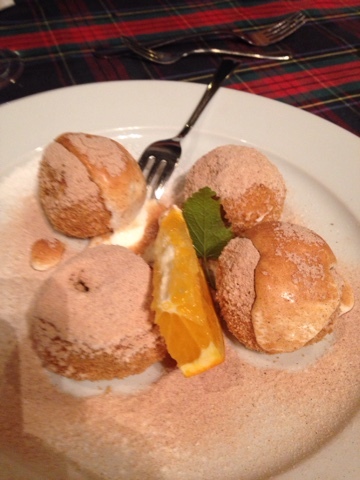 I was far more impressed by the food in Budva, Montenegro, than that in Dubrovnik, Croatia. 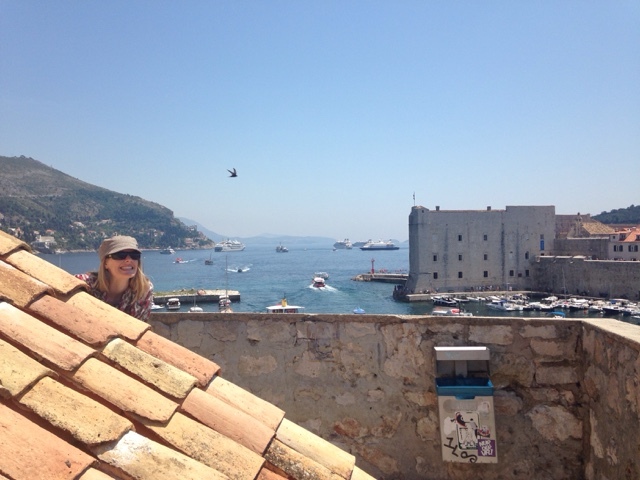 Like many tourist destinations, I felt like Dubrovnik's food was solidly ok but a bit overpriced (relative to the region of course). 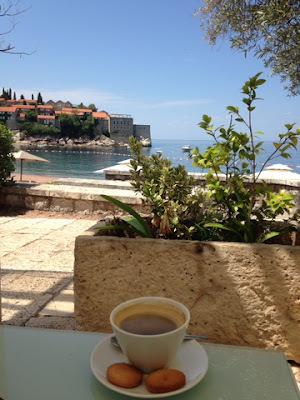 If, like almost everyone in Dubrovnik, I was on my honeymoon and happily spending all the dollars (or kuna, as it were), then I think the fancy food would be excellent. But for a moderately-spending traveler it was good but not great. 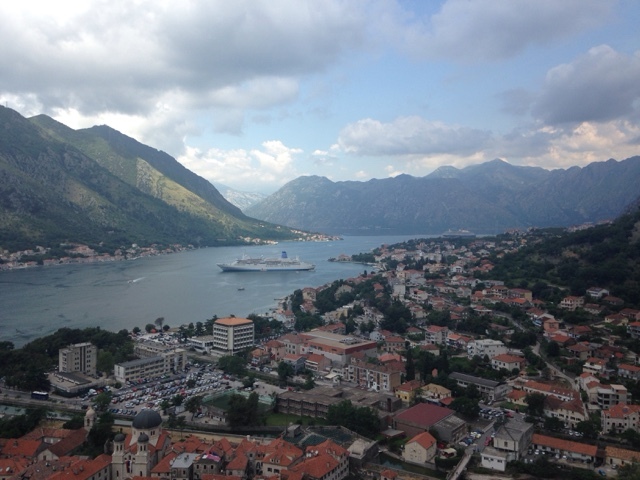 Montenegro, on the other hand, was GREAT. Maybe this was just the luck of where we ate. I don't know. 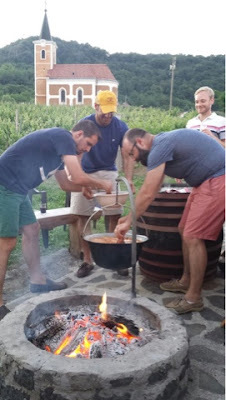 But I do know that I will never forget a few of the following meals! 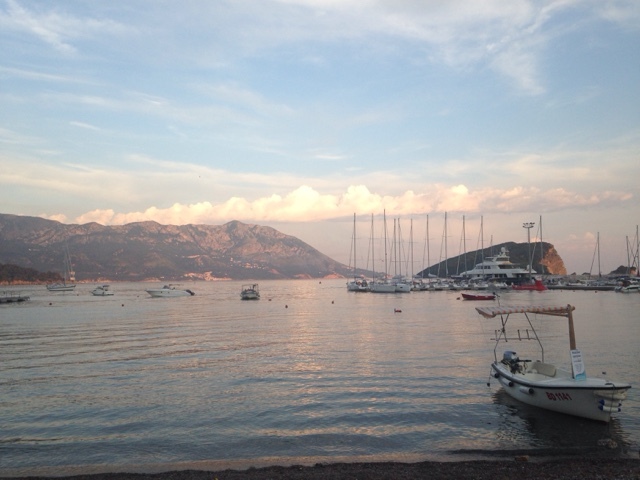 Our first night in Montenegro, tripadvisor dos not steer us wrong. We went to Konoba Knez, a tiny one-man-show locates under an ancient arch in the old city. It's tricky to find, but just ask directions at any restaurant and they'll help you out. Though we were presented with menus, we quickly learned that this is the kind of place that the owner/chef/waiter makes you what he wants to make you, and you enjoy it. The meal began (and ended) with surprise shots of grappa -- oof! 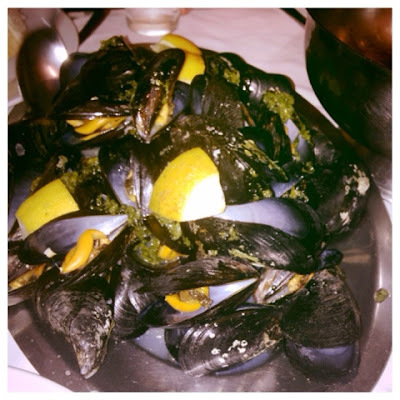 First up was fresh bread and a massive platter of mussels with a garlicy herby sauce. 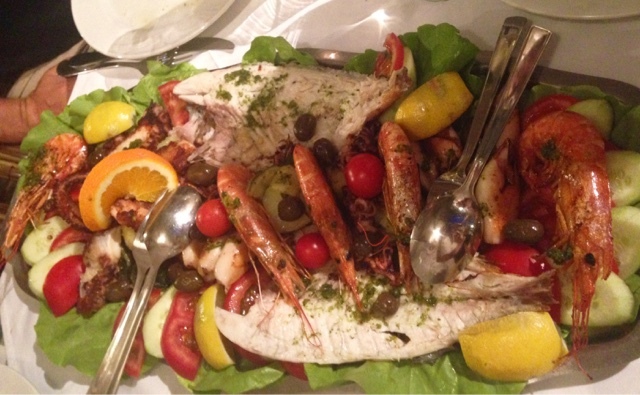 After that (pictures at the beginning of this post), was an even more massive platter of the best cooked seafood I've ever eaten. Shrimp, grilled octopus and calamari, and tender whitefish, on a bed of lettuce with cooked Swiss chard and boiled potatoes. Memories of this dish will haunt me forever. 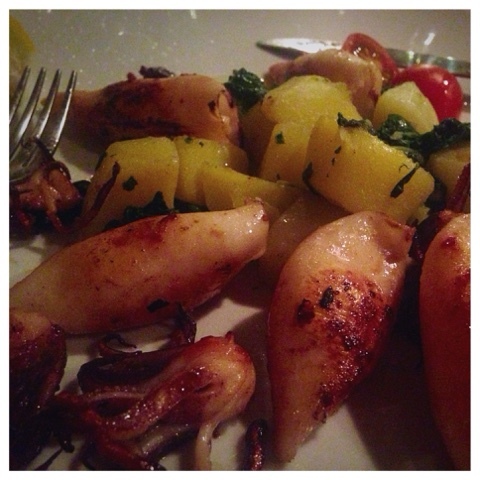 And speaking of octopus and calamari, on to my next favorite meal! 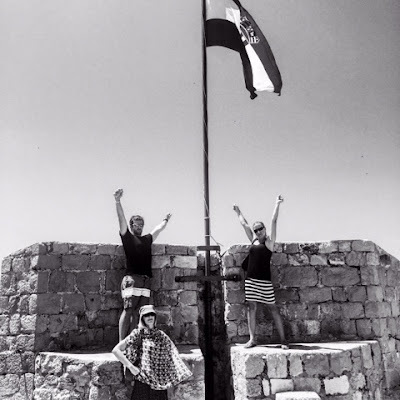 You may recall that on our first full day in Budva we took a taxi to a beautiful beach called Sveti Stefan. There weren't many food options open, so we got cappuccinos and later lunch at my new favorite restaurant: Olive. I ordered the seafood salad, and for just 7.5 euro experienced the most delicious and refreshing assortment of squid, octopus, and salmon, all perfectly cooked (no rubber garden hoses here! ), dressed with olive oil and dill and served on top of tiny potatoes and avocado. SWOON. The next night: more calamari! (We tried to have at least one calamari experience per day). Sadly I can't remember the name of this restaurant, but, ooh hello beautiful. Next, on to Croatia! As I mentioned, I was a little less wowed by the food of Dubrovnik, but certain dishes deserve a shout-out. One of the best things I ate in Dubrovnik wasn't seafood at all, but the Bosnian meat burek at Taj Mahal (which I've already blogged about, but will happily feature again). 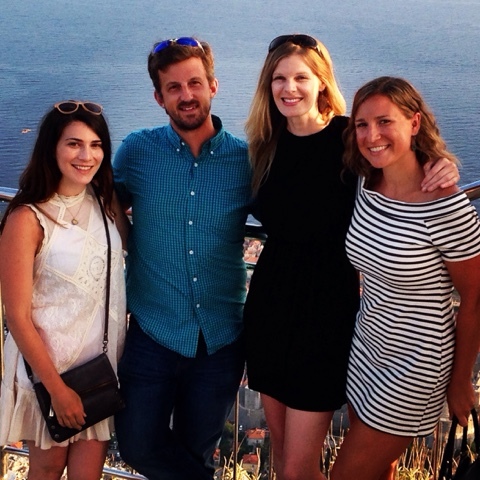 On our last night in Dubrovnik we wanted to go out with a bang. Unfortunately the restaurant we chose took forever (for reals, over an hour...I'm not really into restaurant shaming, but fyi Lajk is not as good as tripadvisor says it is). We didn't eat until after 10, so basically we were starving and anything would have been good. 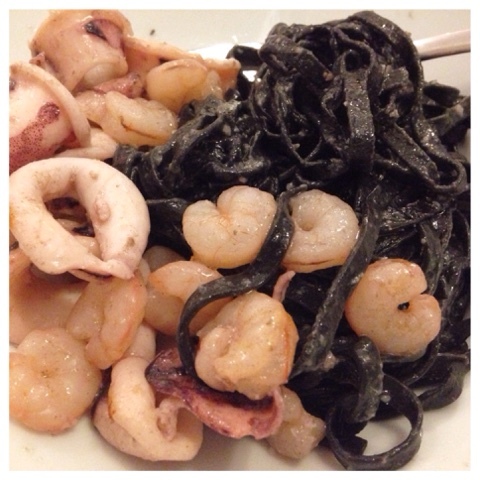 But on the bright side, the squid ink pasta was really flavorful and interesting. You know how people talk about the "umami" taste? That's what this tasted like. The shrimp and calamari in it were ok, but in an interesting inverse of the usual, the pasta itself was the best part. And that, my friends, is that. 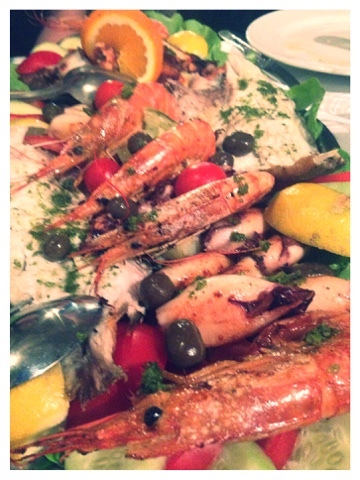 To recap: calamari, octopus, Konoba Knez, Olive Restaurant, eating all the things all the time. 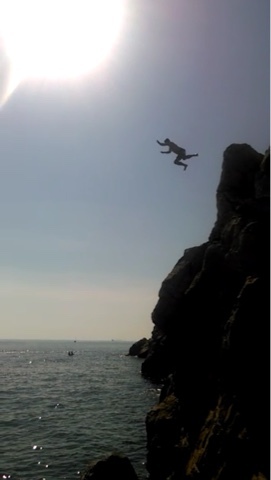 TAKE ME BAAAACCCCKKKK. 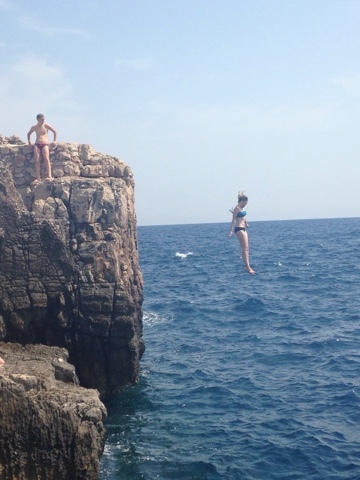 Croatia: Cliff Jumping and Island Hopping! 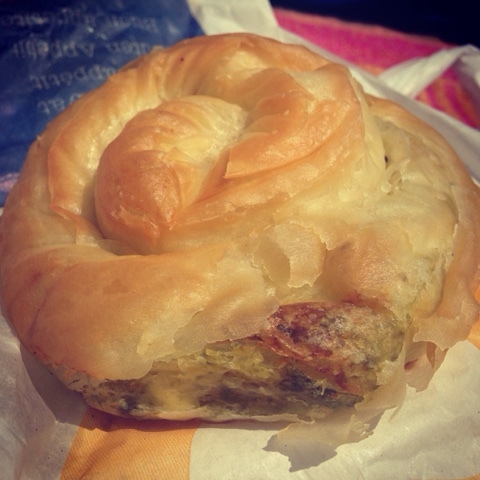 Let's talk about burek for a moment. Imagine a flat square of pastry dough, layered croissant-style but with spinach and cheese between each flaky layer instead of butter. Then roll up that square and twist it into a knot, ensuring equal flaky pastry and savory spinach and cheese in each bite. Yeeeep. This is my new favorite pastry. It puts all croissants to shame! On our second day in Dubrovnik we picked up some burek on our way through the Old City, heading to the harbor. We took a boat (60 kuna round trip) to Lokrum Island in the middle of the bay, which we'd kayaked around the day before. On the island there's a really old Benedictine monastery, and a not quite as old but still pretty freaking old Napoleonic fort on the top. 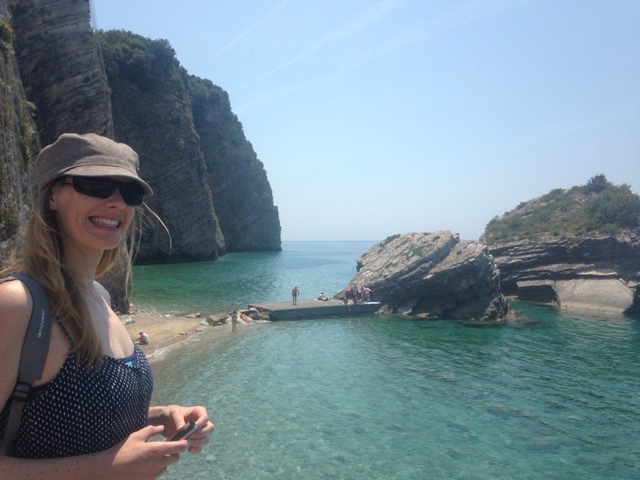 The story goes (according to our kayak guide) that when the monks were kicked off the island they put a curse on it. Since then, everyone who has owned the island had been cursed. This includes wealthy nobles back in the day, Napoleon himself (oh hey Waterloo), and today Croatia (which, though a beautiful vacation spot, is pretty much bankrupt). And to finish off this fable, the screams of the cursed souls can be heard on the island all day and all night. Or they're peacocks...I'll leave that one up to you. For sunset we took the gondola up to a panorama view above the city. 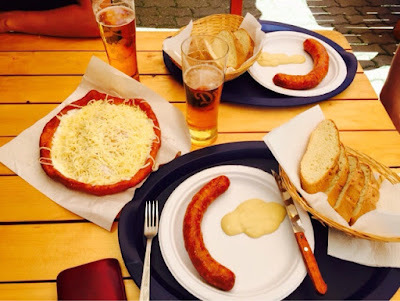 It was a bit pricey (108 kuna, or $18 US) each, but totally worth it! We got drinks at the fancy restaurant up there, but I'd actually recommend bringing your own snacks/drinks and just siting on the viewing deck to watch the sunset up the coast. It was, again, a lovely day, and our last all together! 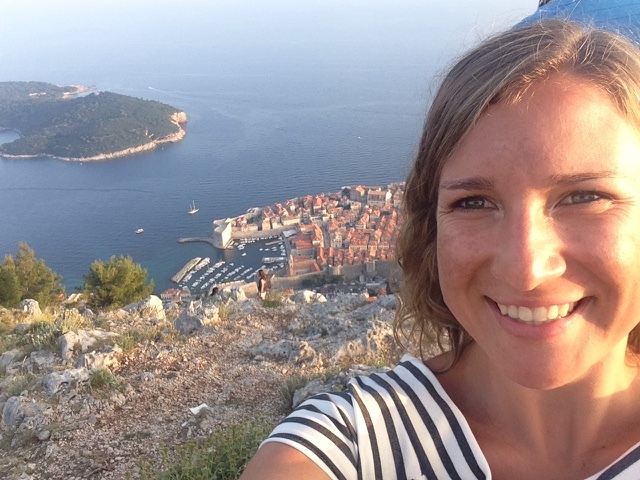 From here, Rose and I go on to Budapest then back to Boston, Laura meets her mom in Paris, and Tim's travels have only just begun and will take him through Europe and all the way to Cambodia over the next few weeks! 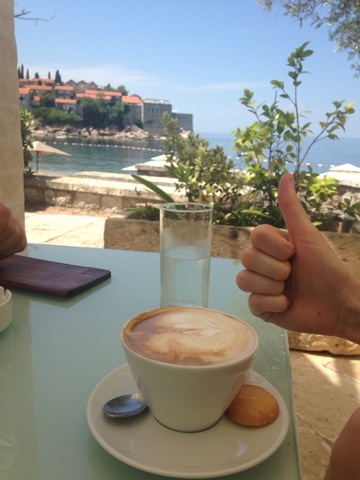 What a good day, Dubrovnik! Well done! 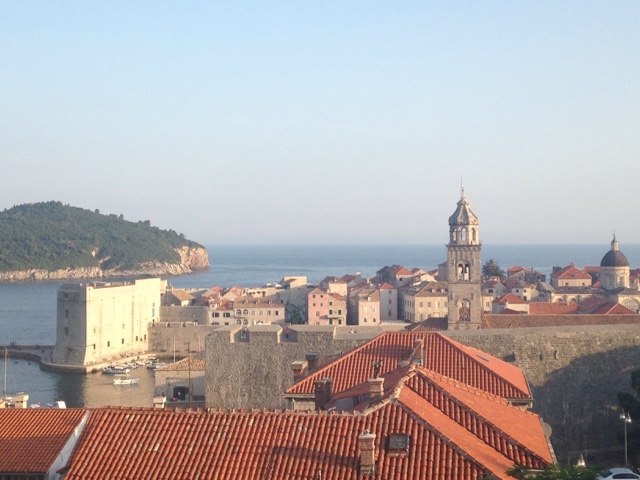 This place (which is King's Landing in Game of Thrones) has rapidly made its way into my top three cities -- I cannot believe how great it is! We're staying outside the Old City at an adorable airbnb with a sea view. 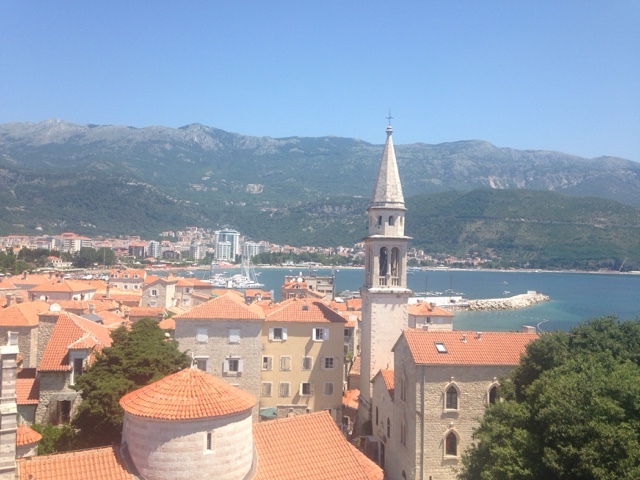 This morning we walked the 15 minutes to the Old City to explore the wall, a very hot but totally worth it 350-degree panorama of the city and the sea. Waking around the top is like being in a King Arthur book (don't worry I've read them all), except for significantly sweatier. After the wall we stopped by Taj Mahal, which despite its name serves authentic Bosnian food, for a light lunch. However, if your wallets happen to be heavier than ours, I highly recommend this place for a heavy lunch. Or dinner. The meat and tziki bureh was a delicious philo dough roll of the most flavorful meat ever. I think this is one of the best dishes I've had on this trip. 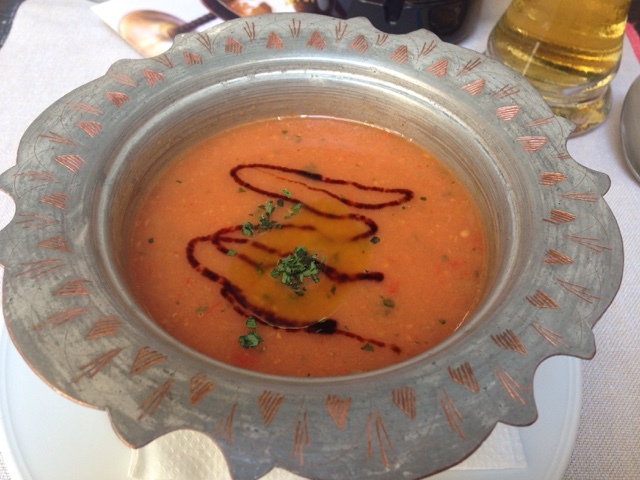 Then I just had a gazpacho, which was quite prettily served. After a leisurely lunch, we made our way to the southern-facing outside of the wall where there is a tiered bar built into the rock and below that rocks to sunbathe on and/or jump off of. 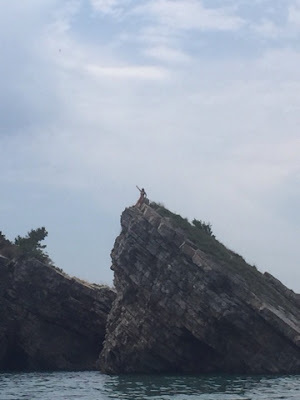 I swam and climbed on rocks while two of my comrades jumped from quite the high heights! 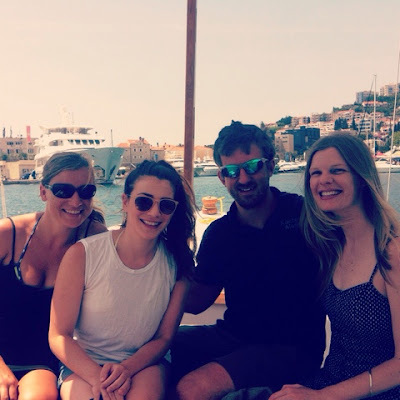 At 5pm we reconvened just outside the city walls for a subset kayak tour. It was 35 euro for about 3 hours, and actually a surprisingly challenging amount of kayaking! 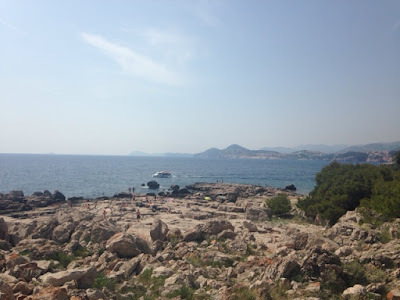 We kayaked past the harbor, along the coast a bit, then around the Lokrum Island in the middle of the bay. Unfortunately, the sun is late in setting these days, so we landed before it hit the water (dear kayak tour, better timing next time please). 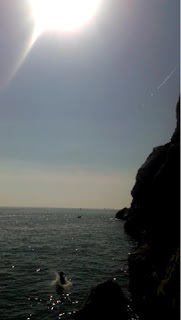 But we went back to our seaside rocks to watch the sunset from that point. 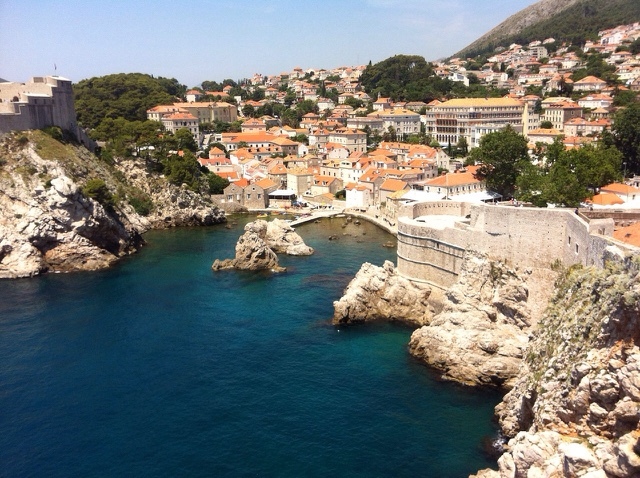 More about Dubrovnik on its way...this city is just too awesome to be captured in one post! 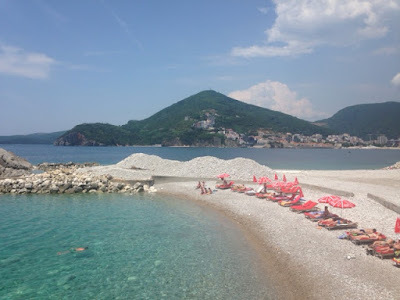 Montenegro: The Beaches, Oh the Beaches! After two weeks of vacation, we needed a vacation. * So we headed to Montenegro, the most beautiful little country no one knows anything about. To get here we drove down the Dalmatian Coast at sunset, which is just as beautiful and exotic as it sounds. Montenegro is directly across the Adriatic Sea from Greece, with a Mediterranean landscape of steep green hills plunging directly into the clearest blue water I've ever seen (for reals, clearer than Lake Tahoe). The coastline winds in and out, creating hundreds of tiny coves and beaches and inlets and islands, perfect for beachy explorers. 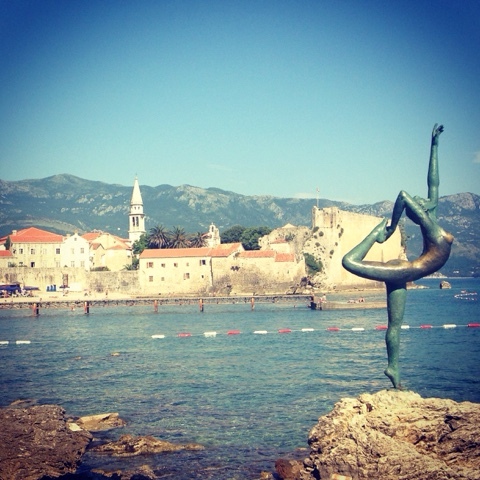 We took a bus from Dubrovnik, Croatia, to Budva, Montenegro, a lovely little beach town. 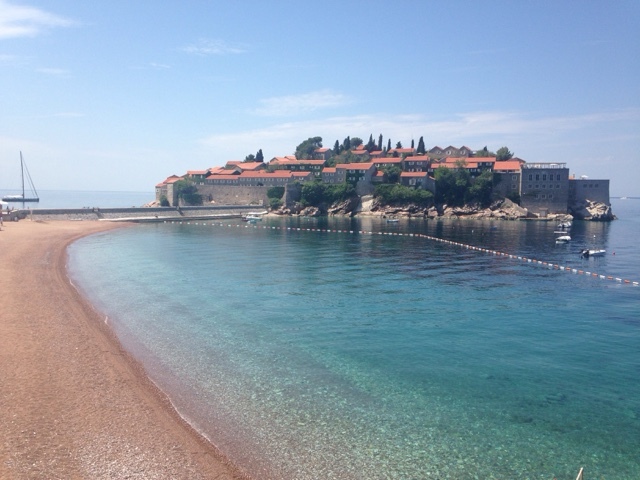 On our first full day we took a 10 euro taxi to Sveti Stefan, a lollypop peninsula with perfect beaches on either side. The peninsula itself is inaccessible -- it's now a luxury hotel compound. 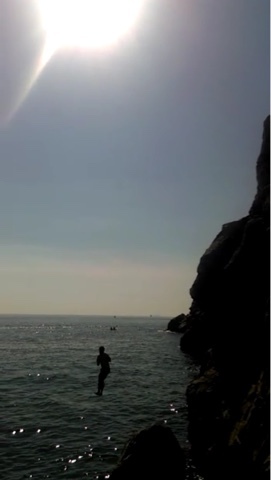 But the beaches are perfectly pebbly and the water is cold enough to be refreshing but still warm enough to swim. And in early June, pre-high season, there was plenty of space for us to lay our towels and beached bodies whatever we wanted. 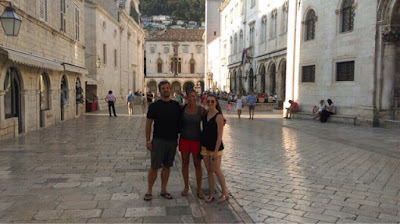 The next day we took a 20-minute (3 euro) bus from the Budva bus station up the coast to Kotor. There, like salmon swimming upstream, like fast runners stuck in the back at the start of a 5k, like, the most determined shoppers on Black Friday, like, well, you get the idea, we waded our way through slow moving cruise boat tourists in the walled city until we finally found the path up to the castle. It's 1,350 stairs, 260 meters above sea level. Aka quite the sweaty hike. But totally worth it for both the exercise and the views! 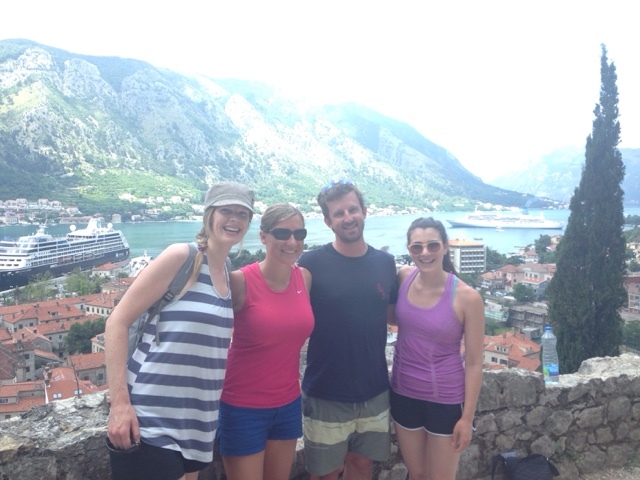 Our tired group headed back to Budva that afternoon for, you guessed it, more beach time! I settled down with my book of Bosnian short stories by Ivo Andric, which the Budva bookstore proprietress highly recommended with hand gestures and vigorous nodding (the only other books in English were trashy romance novels). Our third beach day was possibly my favorite of all (though it's really hard to pick a favorite). We took a short water taxi to Sveti Nicholas (15 euros round trip), the island in the middle of the bay. Our boatman dropped us off around noon and agreed to return at four, a solid amount of time for beach relaxation and fun. 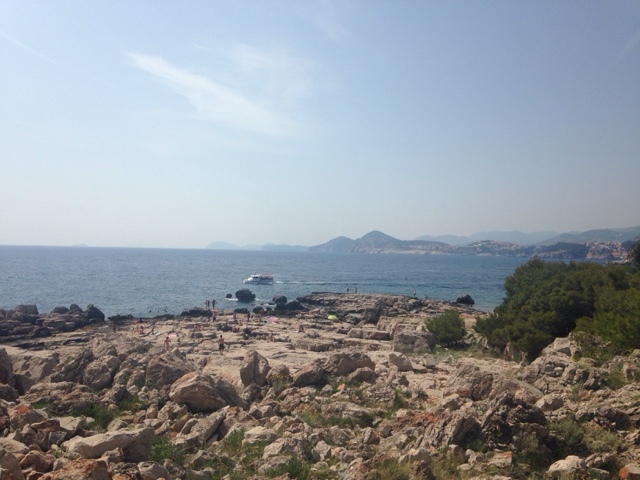 This island had not only postcard beaches, but also rocks to climb! Which of course I did. The water was deep and completely clear, so if a person were the type of person who likes jumping off things, that would be an option. 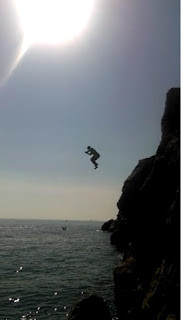 I, however, contrary to popular assumption, do not like jumping off of things. So I scooted my way down and slipped into the water at the very bottom -- much safer and far preferable in my opinion. 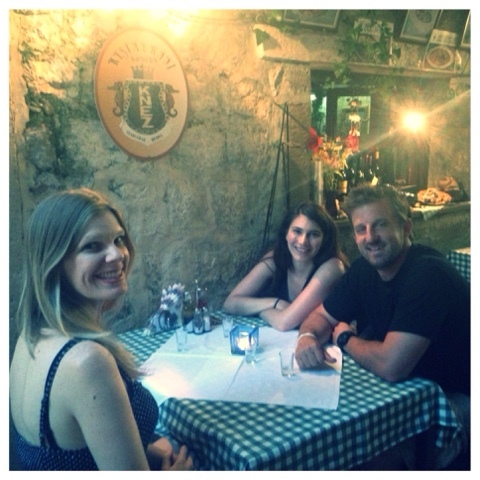 We water taxied back for yet another relaxing evening of chilling on the balcony of our airbnb and eventually meandering into the old city for a sumptuous seafood dinner. 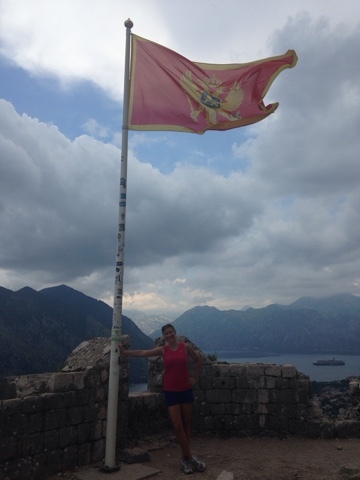 Our final morning in Budva, we "toured" the citadel. There isn't much to see in there, but the views are nice. And that, dear friends, is that. 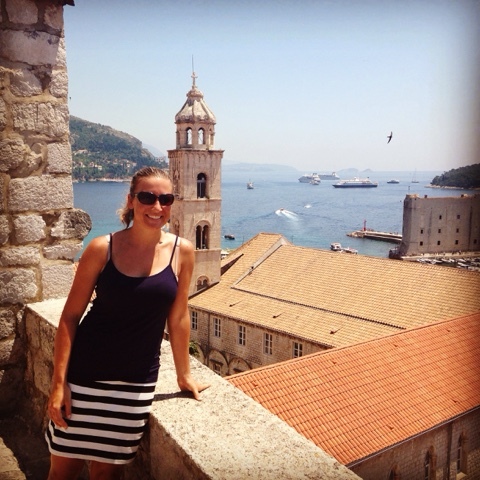 In case you can't tell, I highly recommend you look into a Montenegrin vacation. 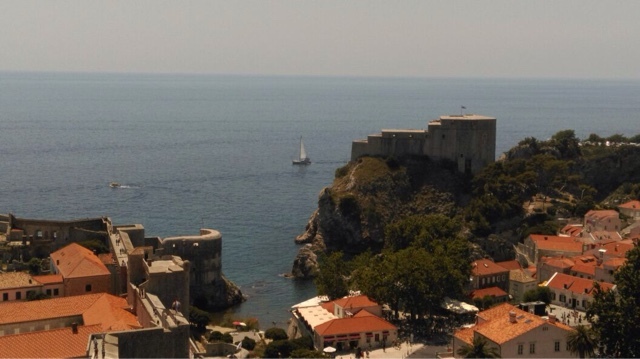 Next stop Croatia! *Living and loving the dream, one day at a time. This might be my favorite meal of the trip thus far. EVERYTHING IS AMAZING. I can't even articulate I am so overwhelmed by deliciousness and joy. Ok ok I will try. As far as I can tell, Hungarian food is all about paprika. And dill. 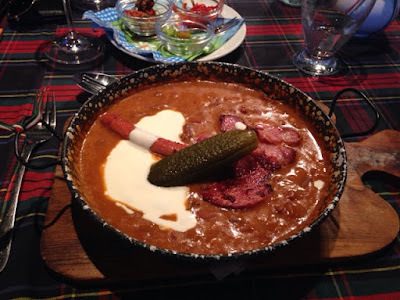 And sour cream. And delicious meat. 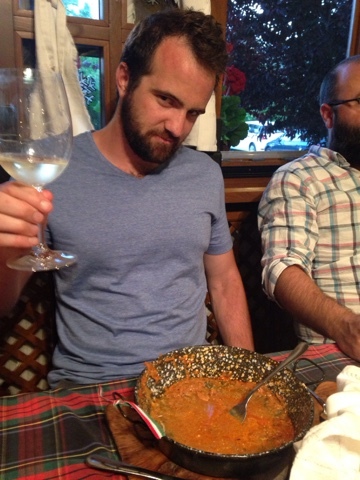 And, when dining along the shores of Lake Balaton, the fish is pretty great too. This meal was a tour de force. Twelve Americans (we'll count the Dutchman as an honorary American in this context) entered an out of the way living room-style dining room in Szigliget. We immediately made friends with the owner (seriously, he put our resident Hungarian-American Chris on the phone with his distant relative living in Connecticut, earning us a couple rounds of smoky sausage/tomato/bread appetizers and an excellent set of menu recommendations). 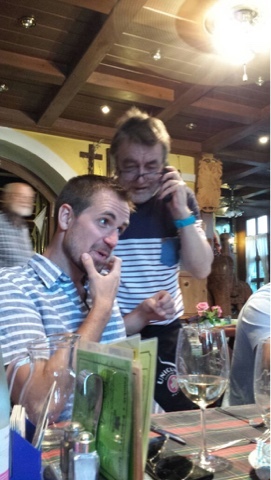 The waitress, communicating with Chris in Hungarian, tried to disaggregate her recommendations by gender (i.e. lighter portions for the ladies), but he quickly dispelled her not-unreasonable notions with a "oh you don't know our ladies. These ladies can eat." 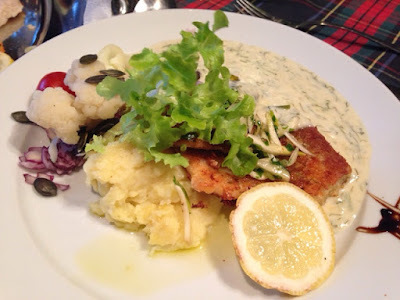 I did a fishy splity-split of catfish with mashed potatoes, cauliflower with pumpkin seeds, and dill sauce as the first dish, and a local fish with pumpkin potato pancake and that same dill sauce. 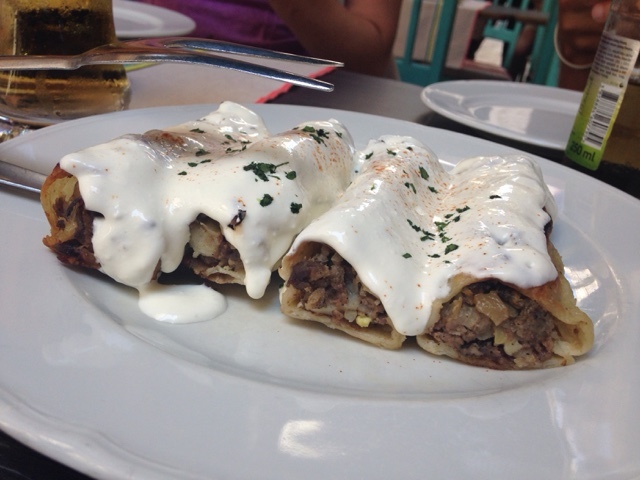 We're all about sharing, so I tasted a few other meals. It's a tough call between cabbage with sausage skillet and the Hungarian beans, pork, and pickle. Both were SO GOOD. (And so huge.) 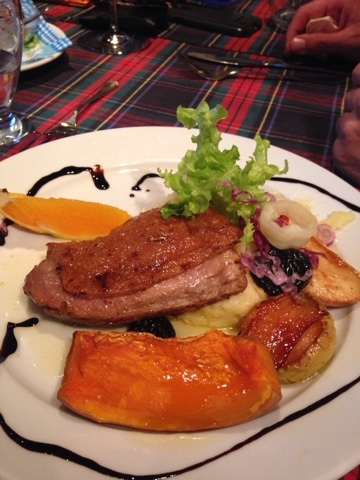 Pictured above is the duck breast with prunes and pumpkin, which its eaters claim is the best thing they've ever had. Bold statement. Being the eating champions we are, we polished off all the food, and then moved on to dessert! 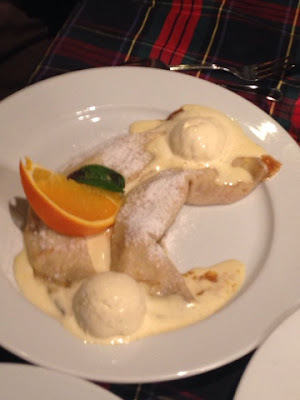 We ordered five for the table: two crepes, poppyseed cake, doughnut-type fritters filled with apricot jam, and chestnut pudding. 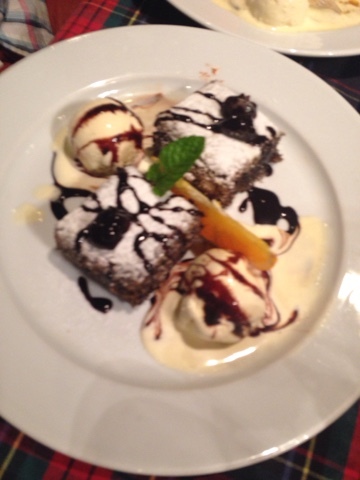 The poppyseed cake was dense and seedy and flavorful. I'm pretty sure it was just ground poppyseeds, eggs, sugar, and maybe some brandy. Yummmm. But the best part was the chestnut pudding. Tragically I was too distracted by eating to snap a picture, but believe me when I say, it's worth a trip to Hungary just to try this! So that was a meal for the record books. But my food epic doesn't end there! 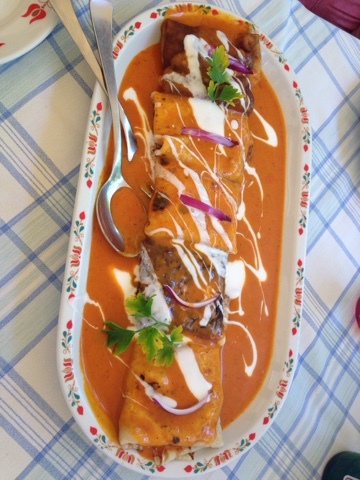 First, let me draw your attention to meat crepes covered in creamy paprika sauce, eaten at a lunchtime stop on our way to the vineyard. Third and finally, one of my favorite evenings of the trip. 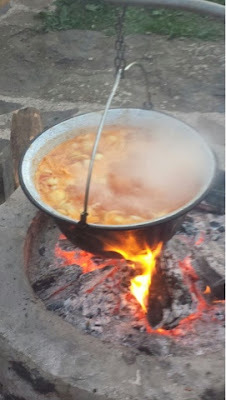 Our firemasters concocted a giant pot of stew over the open flames: potatoes, onion, chicken, paprika roux, and I don't even know what else. Part of its charm was the way it was cooked and the accompanying sunset/night sky, but really this dish would have been good anywhere. And that, my friends, is that. 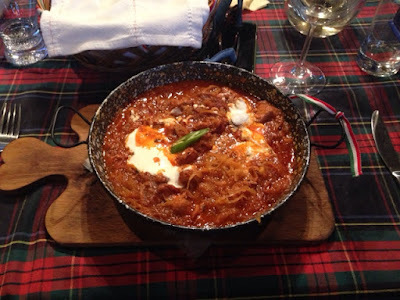 Hungarian food gets all my thumbs up!